Lights! Action! Looking through an eyepiece is all very good, but almost every astronomer will, sooner or later, get captured by the urge to photograpth what he can see. I will talk about this more in another section. Very briefly, cameras are either conventional (ie film based) or digital (ie CCD based). All manner of cameras can be turned to astronomy. WEbcams, digital cameras, mobile phones etc. Best of the bunch are the specialist astronomical CCD cameras. They have a specialist price too. Back in the good old days an astronomer was quite happy going out into the field with his scope and eyepieces, and, maybe, a convential SLR camera. Not so these days! Every astronomer worth his salt uses a computer - usually a laptop for portability. Computers have two main uses: Cameras and star charts. A computer is vital for the operation of a modern CCD camera. These all come with image capture software and the camera is usually attached to the computer by USB... avoid parallel connections as these are painfully slow and dreadfully old fashioned. Many computerised star chart (or planetarium) software are in circulation for varying cost - ranging from free to lots. The best of the bunch is probably THESKY. Like many of the available software, THESKY controls your mount, giving you the marvel of one click GOTOS. However, THE SKY does this with a twist - TPoint. This is a sort of "enhanced GOTO" which takes into account the mechanical inadequacies of your OTA and mount. Other uses of a computer include operating filter wheels, focusers, weather stations. 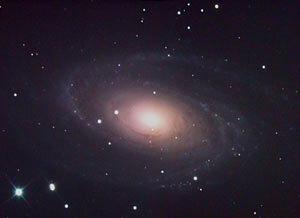 You can even download parts of the sky from the Digitised Sky Survey to compare with your own images. Astronomy, like any hobby, attracts lots of people selling a massive range of accessories of varying usefulness. Observing tents. Dew heaters. Eyepeice holders. Mind you, one can hardly blame them, very few hobbys contain such a wealth of disposable income that astronomers seem desperate to get rid of. Telescope Buying Advice - some advice to a friend. Photons - How many astronomers does it take to make a cup of tea?